ClickTracks is a good log file analyser tool that comes at an affordable cost. Below are the four major valuable reports ClickTracks can render..
Navigation report contains three parts. They are website view, page analysis & path view. The website view allows you to navigate to any page just like you type websites in your browser.Website view displays information on how frequently visitors click on each link. 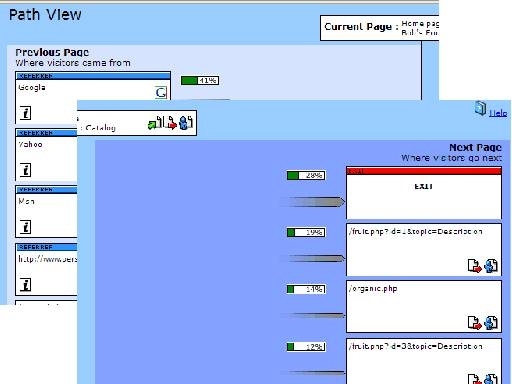 The page analysis frame displays further information about the page currently displayed in the website view.The page analysis frame presents further information related to the current page in the website view.Below are the metrics displayed in the page analysis frame. Here we can see the total number of visitors that saw the currently displayed page.Of all visits to your website, this shows the percentage that viewed this page. Please note that a single visitor will not be counted more than once if they hit the page numerous time in a single visit. 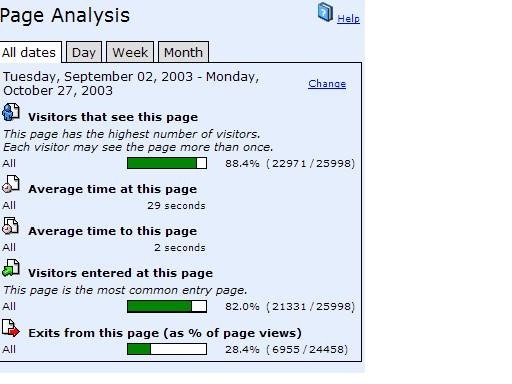 In the parenthesis after the percentage, the first number shows the number of unique visitors to this specific page, and the second number represents the total number of unique visitors to the site. 2.Average time at this page. 3.Average time to this page. 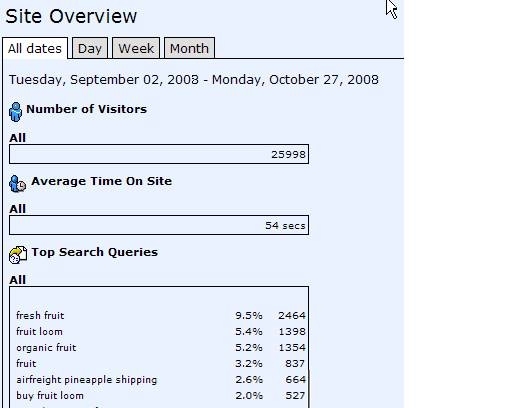 Shows how long it took visitors to reach the page from the moment they hit any page in the site. 4.Visitors entered at this page. The path view details the pages visitors were on prior to the current page in the website view and also list the pages they visit next. The percentage and colored bar underneath each hyperlink on the report indicates all traffic to this page, what percentage clicked on each link. search terms that were used, and along the top are various search engines. Cells that are darker indicates the greater number of referrals. Site overview provides information in a more traditional table format. 1.Total number of visits to the page. First is the total number of visits to the website. Visits are not unique to an individual; one individual might generate several visits. Here are the top keywords entered into the search engines that generated referral to the website. Unlike those on the search report, the search terms on the site overview are not separated by search engines. 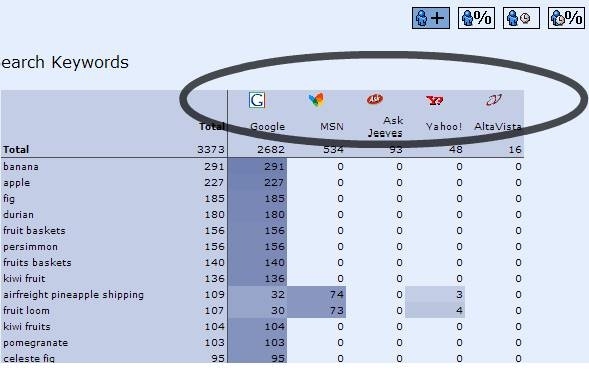 These are top websites with links that referred visitors to your website, for eg:- a search engine, or an online campaign. Visitor labelling shows segmentation of the visitors by their behaviour. This can be done by on-demand basis. Group of visitors are tracked under visitor labelling. There are several predefined ways of grouping, or labelling visitors. Suppose you want to see how the visitors that actually bought the product behave on the site compared to general population. First, select "reached check out or other goals." This wizard allows you to select any page of your site from drop down menu. If you are interested to see people who have purchased the product behave, select the checkout page. Now a label has been assigned to this group of visitors. Click 'go" to re-analyse. You now have a color coded visitor label showing your segmented visitors.The percentages and totals shown on the new label reflect the visitors that satisfied the action you identified, in this case those visitors that hit the checkout page. 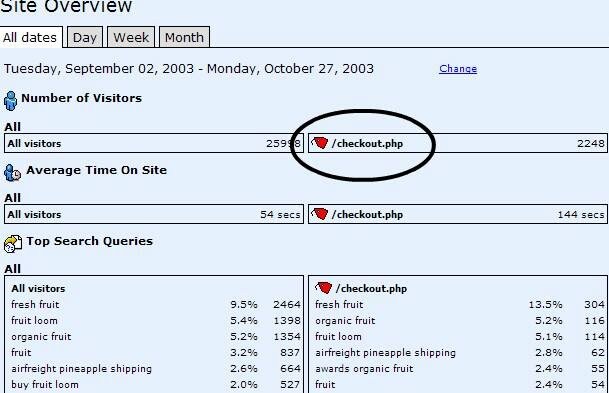 The new label shows of all the visitors landed on the checkout page- or bought something 'what percentage clicked on each link.' The visitor label now show the information about particular group of visitor on all reports.And on site overview, you can see specific information about this visitor. By examining the behaviour of visitor groups you value most, you can target your site to these most important users. group. Click here to get more information on ClickTracks.